Things have been pretty hectic around here lately, and there hasn't been a lot of time for sewing or making things. Plus there was something else that was bothering me and making me in a not-so-crafty mood. She lounged like this on the gumdrop pillow for ages, half upside down and looking like some kind of bad taxidermy experiment. It was hysterical. Needless to say everyone was upset by the awol bunny. My husband (who left the door open) felt guilty. The middlest made his usual comment of "Well, we can just buy another one" (always pragmatic, that one). And then last night at about 8pm, a knock sounded on our door. Our neighbor was standing there holding a VERY muddy, hideous looking Guinevere. We were so happy! She got a bath (and a lot of junk picked out of her fur) and seemed none the worse for the wear. Although...maybe some mongrel bunnies will be born next month? There are a LOT of manly little bunnies in our woods. Maybe she left cause she was just lookin' for love in all the wrong places. Anyway, with the bunny back safely I felt like sewing again, so this morning I finished up Lightning 2.0. Yay! Hope you're all have a good week! We're starting homeschooling next week so things will likely be pretty crazy around here. But I'm SO ready for fall. I'm so glad your bunny is okay! The picture of her lounging is hilarious. 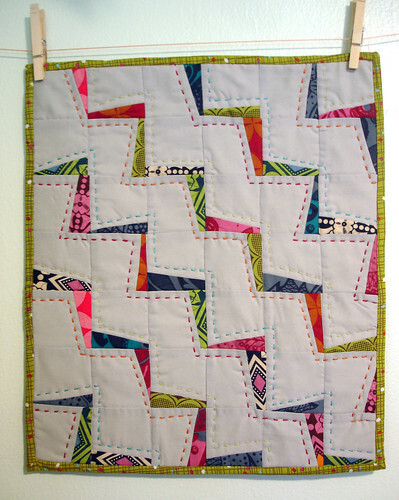 :) And your second lightning quilt is so cool! I am so happy your bunny rabbit is ok. And I love # 2.o. Looking for love in all the wrong places? Oh my gosh, I cannot stop laughing. Wow! I think I love this even more than the original! 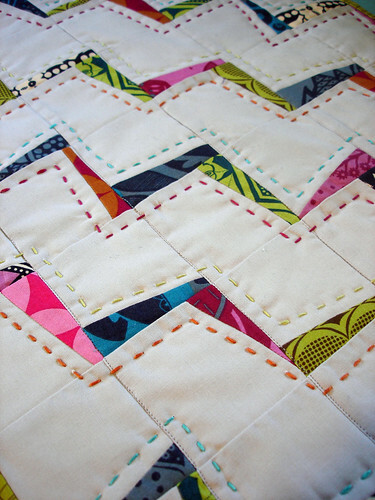 Jenn, what sort of thread do you use to hand quilt this? I love how thick the stitches look! I used embroidery floss for this, all six strands together. I'd love to try perle cotton one day, too! So glad for that your neighbor brought her home to you! its totally fabulous, I found your blog via pinterest of the one you made for your DQS partner..